Tell the state of California to stop rubber-stamping PG&E’s attacks on communities. The California Public Utilities Commission (CPUC) has been allowing PG&E to raise rates to cover avoidable costs — including liability for devastating wildfires and gas leaks. And the CPUC has been passing policies designed by PG&E to prevent communities from creating their own electricity services (community choice energy). California’s devastating wildfires set the stage for the California Public Utilities Commission (CPUC) to provide Pacific Gas & Electric (PG&E) with a $6 billion bailout assist. Next, the CPUC will pass tens of billions in fire liability costs onto the public—propping up a monopoly utility the courts have found to be criminally negligent. 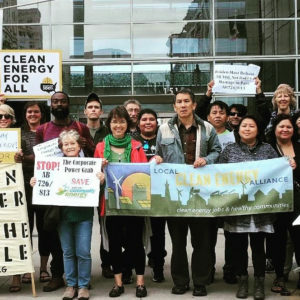 Join with the California Alliance for Community Energy in asking legislators to hold the CPUC accountable for representing our interests. Tell the CPUC to roll back its latest attack on community choice energy: the decision last fall to raise the exit fees that community choice customers have to pay to their former corporate utility companies. And tell Governor Newsome to appoint CPUC Commissioners and top staffers who support community choice and prioritize communities’ interests.